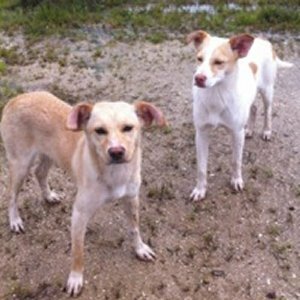 This link to an expatriate forum in Portugal shows pictures of two sad Podengos that were cruelly abandoned beside the A8 motorway (freeway) in Portugal. They were about eight months old. At first they refused to leave their position beside the freeway since they clearly hoped that the owner would return. Eventually after a German woman had taken them food and water several times, they ran across the freeway to greet her. They were hit by a car, which did not even bother to stop. Both dogs were rescued by the German and her Portuguese husband who already looks after 4 other dogs and 10 horses. I do not expect that anyone in the US will be able to help to find a home. But I did feel that readers would like to see and hear of the plight of Podengos in Portugal. Both females have been on heat - a risky situation in rural country. It costs €250 (about $350) to spay a female in Portugal. The charge increases with the weight of the dog. Many people do not have that sort of money to spare, so they either abandon unexpected puppies or kill them.